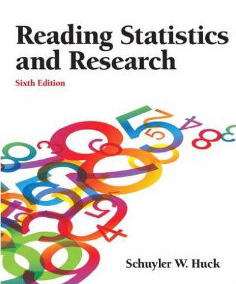 This website has been created for the book, READING STATISTICS AND RESEARCH (6th Ed.). Hopefully, it will provide you with new information, answers to puzzling questions, insights into statistical reasoning, and a greater appreciation for the "art" of doing statistics and research properly. Thanks for visiting. May your experience be both informative and enjoyable!!! This Website has different sections that you can enter by clicking on the "Chapters" button located above. Depending on your personal circumstances, certain sections are likely to be more helpful to you than other sections. Book Info leads to information of likely interest to anyone who's considering purchasing this book or adopting it for a college level class. In this section, you'll learn more about the book's purpose, intended audience, content, unique features, etc. An Ordering section leads to information that will help anyone who wishes to adopt the book for a course, to make an individual purchase, or to order an examination copy. Author Info leads to descriptive information about the author, such as a biographical sketch, summaries of his teaching and publishing involvement, and a silly (but truthful!) page documenting the author's goofy "accomplishments." Also, you'll find here information showing how to get in touch with the author for the purpose of asking questions, offering suggestions for improvements, or pointing out mistakes you have detected in the book.